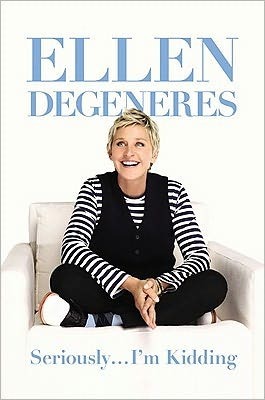 Reading Ellen DeGeneres’ Seriously… I’m Kidding is like having a casual, one on one conversation with Ellen herself. The book is hilarious, rather sweet and oddball, with the wonderfully sunny outlook on life that has become Ellen’s trademark. It also often veers into the pointless, with sight gag chapters that probably would work well as minor sketches on her show, but are just worth skimming in a book. On the bright side, I’m Kidding is overall a feel good book, cheerful and optimistic without being preachy. It’s Ellen, on the page, and a fun way to spend your commute. There are a few completely random chapters. One can almost imagine her Finding Nemo character Dory narrating some of the passages, with their pointless digressions and wide-eyed punchlines. In one chapter entitled “Ideas,” for example, Ellen rambles about everything from smiling to astronauts. Presumably, she means to mimic the brainstorming process, how each idea leads on to another with the barest minimum of connections, and so on. Except it plays out like a comedy routine that seemed funnier than it really is, and the punchline, “I’m sorry, maybe I shouldn’t have written this chapter,” backfires when the reader reluctantly agrees. Ellen is at her best however in the somewhat more serious chapters. She never allows herself to become Oprah-esque, pulling back with a wisecrack just when she’s dispensed some bit of wisdom. The overall effect is that of a woman who is afraid to let the mood get too sombre, and who therefore undercuts her own advice with humour. That being said, in many of these instances, the humour actually enhances the impact of the advice, and at times reveals further insight. Take for example a thoughtful chapter on the meaning of life. Ellen observes that people disagree about the nature of happiness — some say we should live each day as if it were our first, and others say we should live each day as if it were our last. It’s confusing, Ellen admits, then immediately quips, “Either way you should probably have a diaper on.” Good point, a quick joke, and a good reminder that prescribed methods of finding happiness aren’t foolproof. Hear hear, Ellen DeGeneres, hear hear! She immediately undercuts that inspiring passage with a joke, but then switches right back into incisive observation so seamlessly that the interjection of jokes feels natural. If you buy it, you will feel better, look better, be happier, grow taller, lose weight, get a promotion at work, have shinier hair, and fall madly, deeply in love. is a joke, but like many chapters in the book, holds a grain of truth. Ellen’s humour is so infectious that this book will most likely cheer you up, and if you haven’t fallen in love with Ellen yet, some chapters in this book might make you do just that. Thank you to Hachette Book Group for a finished copy of this book in exchange for an honest review. This entry was posted in Book Reviews and tagged 50BookPledge2012, HBG Canada, Non Fiction by Jaclyn. Bookmark the permalink. I’m currently reading Seriously.. I´m Kidding and I think that this book is amazing, I love to hear Ellen´s voice. I’m reading it and I fiound very little insights into Ellen’s life. I found it boring with too much artificial sweetener.